One of the fine attributes of Louisiana irises is their foliage. Along the Gulf Coast and in much of the country, the green leaves are handsome in winter. From fall when the new growth cycle begins and through the bloom season in spring, Louisianas are a welcome addition to the deciduous garden. Louisiana iris foliage is coming on and greening up as many other plants are going to sleep. In cold areas with snow cover, Louisianas are hidden until spring. The plants are cold hardy and will emerge with warmer weather. But they can't provide the winter green that they do farther south. On the other hand, they are less likely to exhibit the scruffies that can occur in the long hot summers. In the lower South, the hot, often-dry weather between the end of bloom season in late April and the start of new growth in September can take its toll on the foliage. In the cold north, there is not as much time between bloom and snow. Those summer scruffies are the flip side of Louisiana irises' fine foliage. 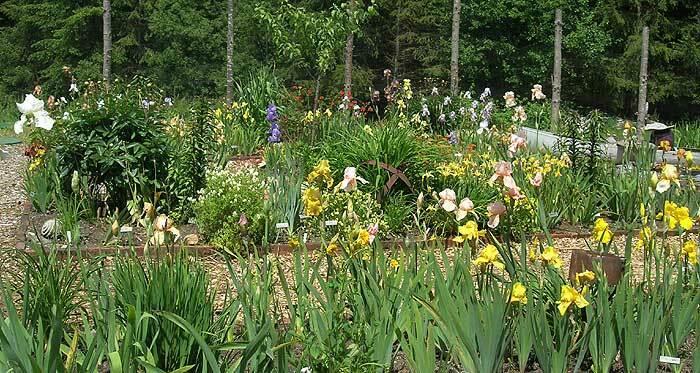 The irises can head into a decline, and a very few may go entirely dormant by late summer. It is not uncommon to see a patch of Louisianas in July or August with partly yellowed foliage and without strong new growth in the center of the fan. It is not attractive, and in a mass planting can be a discouraging display. I have found that declining summer foliage is not inevitable. The key seems to be consistent moisture. In the New Orleans area, we average 60 inches of rainfall a year. I used to think that this was plenty. These things are native here, right? So why worry too much about watering unless they irises are in obvious need? Well, because irises don’t respond to averages. There are often significant periods of drought interspersed with afternoon showers and tropical storms. Once Louisiana irises show that they have been too dry, the slide toward dormancy has already begun, and it is difficult to reverse. When growth has been interrupted by insufficient water, it will not generally resume with much vigor until fall. If the foliage is cut back at that point, some new growth will be triggered -- and the plants certainly will look better -- but they will not recover to their same lush, spring-like form. 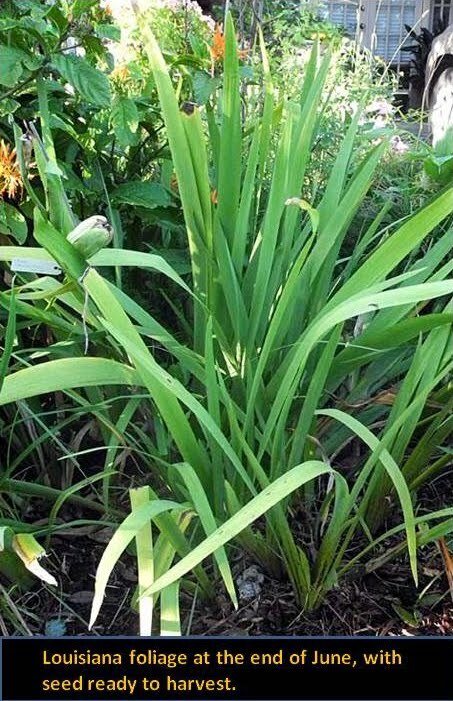 If Louisiana irises are never allowed to get too dry, you can enjoy good green foliage throughout the summer. If grown in beds, an irrigation system is a solution, and it can be as simple as a timer on an outside faucet connected to inexpensive sprinklers. It’s not necessary to pour a large volume of water on the irises. Just keep them consistently moist. A little shade and light fertilizing after bloom is also a plus. Of course, Louisianas can be grown in water culture, in a pond or bog, and then the problem of inadequate moisture never arises. Some varieties, especially those with I. brevicaulis in their background, may have a greater tendency to decline in summer. No solution is perfect, and even with the best cultural conditions it will always be necessary to spruce up the plants, removing the inevitable yellowed blade. No one does this in the wild, of course, and the irises survive just fine. But if you come across a patch of fulvas by the roadside in mid-summer, they are not likely to look good. If it has not rained for a while or if they are growing in harsh full sun, they will have yellow and dead leaves and often they are covered with rust. There is no one to keep them watered, to tidy their appearance, or to discard fungus infected blades. They are on their own and the government won’t help, unless one considers the spraying of herbicides helpful. That does solve the problem in a different manner. "That's not what I ordered!" Anyone that has collected even a few irises has probably run across this problem. The iris you carefully selected from that catalog so long ago and ordered and planted and waited to see blooming finally opens and it is not the variety you had expected to see. It is an age old problem - we can read about it in the old iris literature as well as today's latest iris publications. Getting an incorrect rhizome is very common no matter how careful we are in handling during division, but there are a few precautions we can take before we send our extras out to other gardens, whether you are a commercial grower or just sharing with friends. Tag Bloom-stalks - When I notice during bloom season that two clumps ready for division are growing very close and may be confused later on I'll tag the bloom stalks with the name so I have a better idea of which is which later on. One At A Time - I always try to dig only a single variety at a time, and make sure all fans have a name written on them with a permanent marker before I move to the next clump. Careful Digging - Watch for small pieces left behind when digging. These can often go unnoticed and come up in the midst of any variety replanted in that spot. Verify Your ID - Always verify the identity of your irises while they are blooming by checking them against the official registration descriptions. This is most important when dealing with historics as so many imposters are passed around. While it is irritating when an imposter shows up, we should remember that it could be for a myriad of reasons and it can happen to anyone. Most growers and collectors want to know when their stock may be incorrect, so be sure to let your source know. Also let anyone know who may have gotten an incorrect iris from you. This spring, I had to notify a couple of people to watch their starts of Flutter-By as a few rhizomes of G.P. Baker were in my clump and may have been sent to them under the wrong name. I'll be sending replacements to those who need them. On the brighter side, we sometimes end up with a beautiful surprise and a great new addition to the garden. My few rhizomes of Mad Maid opened for their maiden bloom this spring and were instead flowers of the richest dark chocolate brown. While I don't have a name for it yet it is a very welcome addition to the garden and one I am going to enjoy for many years to come. So while dividing your rhizomes this summer do what you can to make sure your fans are correctly marked. In the future be understanding when the wrong iris shows up in your flowerbed, remember that it's a problem we all share, and enjoy the unexpected whenever possible. There are so many irises named for birds that one could do an entire garden filled with nothing but them. And what a fun theme that would be for a bird lover! Here are five of my favorites. Click the links to learn more about the birds they are named for. Irises are the perfect beginning gardener's plant. 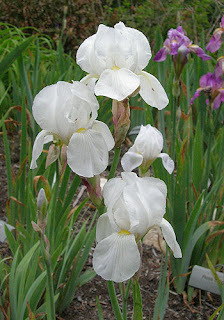 Tall bearded irises in particular grow in most areas of the country, have low water requirements, need little fertilizer, and reproduce perfect copies of themselves. Irises are also the ideal garden flower for those of us who are color-challenged. 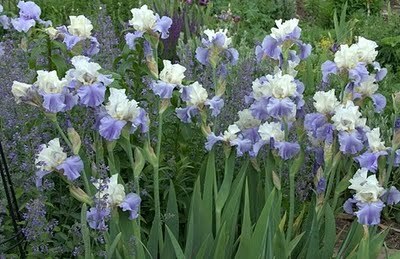 By matching companion flowers to the color of the iris, beautiful garden planting schemes can be achieved even by those of us who wear stripes with checks. The beauty of irises is accentuated when they are set against other perennial flowers, bulbs, shrubs and foliage, or even grasses. The classic companion for irises is roses. Here is reblooming iris 'Total Recall' with 'Julia Child' floribunda rose. 'Sweet Musette' looks great with alstroemeria. 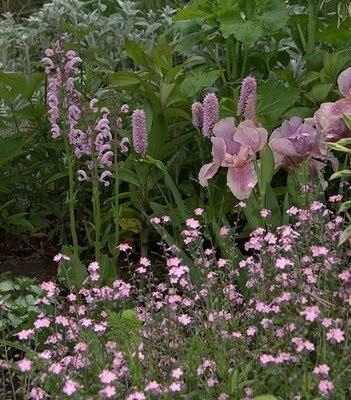 Perennials and bulbs are good choices as companions in colder climates. Brenda Fox gardens on 40 acres of land in Western New York. 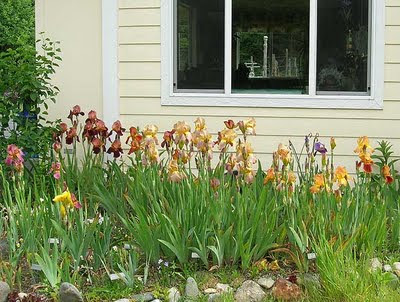 Her first gardening love was irises, and she plans her gardens around the use of a dominant color in each bed. You can see her masterful use of color and design in the garden here. In this photo, she uses 'Gypsy Romance', her favorite iris, with malva mauritania and lupines. She says this is not photoshopped; the iris really is this bright. Nepeta 'Walker's Low' with tall bearded iris 'Dover Beach'. Brenda claims her photo does not do this iris justice. And for those of you who love brightly colored foliage, take a look at Brenda's combination of 'Samurai Warrior' and red barberry. And rebloomer 'Frequent Flyer' with annual paludosum daisies, which reseed. Grasses are a nice contrast to the ornate flower form of irises. 'Rip City' with Japanese blood grass. And the enchanting, muted 'Thornbird' with juncus and artemisia. Some of the most beautiful and surprising uses of irises, however, show a cheerful disregard for color coordination. 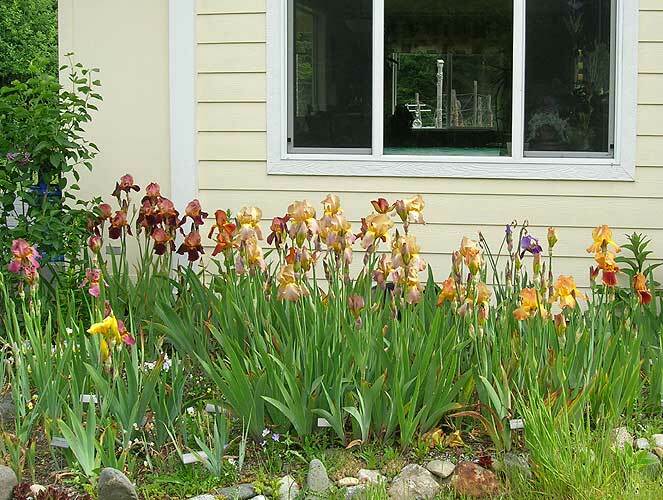 However you use them in your garden, irises provide a rainbow of color. 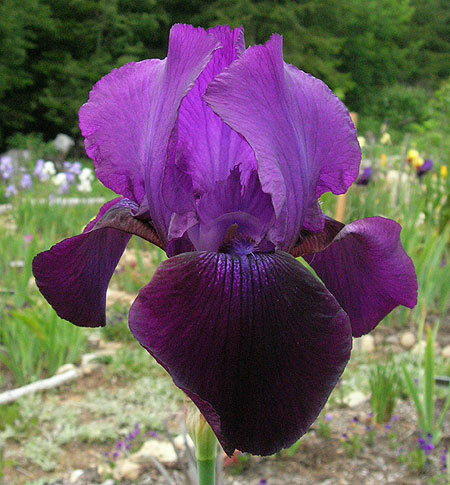 There are as many different ways to enjoy irises as there are people to enjoy them, and with dedicated iris collectors this holds true as well. No one iris garden ever looks like another. As the taste and personality of the gardeners comes into play we see it reflected not only in how the garden is arranged but also in what types of irises are represented. 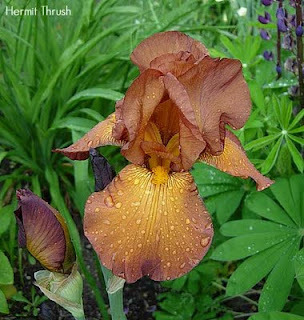 Whether you grow a few examples of different species scattered about your perennial garden, or look for the latest and greatest offerings from the top bearded iris hybridizers, or enjoy the history behind the classic varieties, there is something in the world of irises to please everyone. If you had come to my garden last weekend for the annual 'Open garden/Iris Tour' you would have predominantly seen a wonderful collection of historic irises. 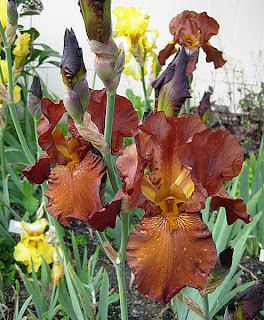 When I first began gardening and was looking around for plants to add to my new beds I was fortunate to have several folks give me starts of old pass-along bearded irises that they had in turn received from a friend or ancestor. When they started blooming it brought back fond memories of my grandmother's gardens, both of which had many irises growing about, and set off a passion for more. 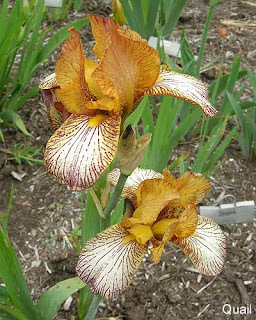 The more I learned about irises and their long history the more I was drawn to those old varieties and the more of them I started acquiring. I have seen folks arrange their beds of old irises by the decade of their origin to lovely effect. Irises of the same era often compliment each other well in their color tones and forms. Planned color schemes, regardless of era of the flowers involved, can also bring stunning views to the flower garden. I've used arrangement by hybridizer to good effect in my own plantings. I work under the theory that hybridizers move reselected seedlings to beds together for further evaluation, and irises planted with others which compliment them could not help but be a bit ahead in the running for introduction, so it is not surprising that those a master breeder finally selected for this honor would all be harmonious in a planting together. At right is a lovely conglomeration of several of the plicatas created by Jim Gibson. Shortly after beginning my collecting I discovered the Historic Iris Preservation Society and AIS too. This has brought me into contact with hundreds of historic iris lovers over the last decade. I love to see how all the different folks I meet decide what to focus on and how they handle their collections and gardens, as seeing other gardens always inspires me to do new things in my own. I not only enjoy visiting iris gardens but I also enjoy showing off my garden by participating in the HIPS Display Garden program. Last weekend a dozen folks stopped by thru the day to tour the flowers and see a wide variety of different members of the iris family. It was great to see so much enthusiasm over these classic flowers. HIPS members are very generous in opening their gardens to folks wanting to see older irises, and I hope you'll check out HIPS' website for the listings and plan to visit gardens in your area. 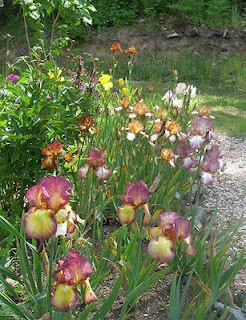 Should you be interested in starting your own collection of historic irises now is a great time. HIPS is currently running their annual Rhizome Sale. This is the Society's main fund raiser which allows us to publish ROOTS, the biannual bulletin of the Society. If you are interested in historic iris, and supporting the mission of HIPS to preserve them, we'd love to get you started. Please see the website for details. What irises do you collect and how do you grow and arrange them? Please tell us in the comments! This is the time of year that one question is asked about irises just about every time we pick up the phone or turn on the computer. The question is, when do we cut the leaves back on our irises? The answer is NEVER, except when you are transplanting your rhizomes. I wish I knew how that myth got started in the iris world. The leaves on your iris plants help in feeding the plant, so why would you want to cut part of it's food supply? The next line I get is, some of my plants have brown tips on the leaves in the summer and I don't like to look at that. OK, if you want to set there and cut one inch off of each leaf to make the clump look better, do it. The key is, I said one inch, not 6 inches. The more you cut off, the more you are cutting the food supply. One more tip, cut the bloom stalks out all the way to the top of the rhizomes, as soon as the last blossom fades away. This is very important, as the stalks left in place, can cause rot. The next question is how much should I water my irises in the summer? The answer is, you don't water your irises in the summer. If you are east of the Rockies, that rule will be great. West of the Rockies, I will leave it up to you, but it is never good to push irises to grow when they should be resting. Unless you have found it just absolutely kills your irises in the west if you don't water in the summer time, I would not do so. If you do, I would do it sparingly, not on a regular basis. I can hear the howling already. I know there will be a number of you that will say I water my irises all summer and I don't have any problems. The key phrase will be, YET. You are asking the plant that wants to go dormant and take a rest to keep growing. In warm climates, like California and Arizona, and perhaps southern Texas, this may be fine. My thought is, in colder climates, this summer growth will wind up being tender for the winter and your plants may develop rot problems. There is a reason that almost every iris grower in the US ships their plants to their customers in mid summer to early fall. It is because the plants are dormant and it shocks the plants less to ship them at that time. Now for the surprise, you must water your rebloomers in the summer or you won't get rebloom in the fall. 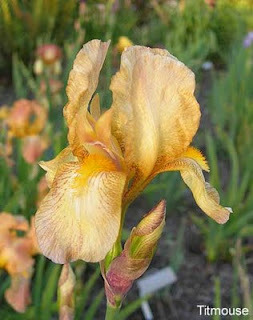 If you are reading between the lines here, a problem may have surfaced for some of you that grow both types of irises. How do I water my rebloomers and not my once blooming irises? You don't. Plant your rebloomers in one area and the once bloomers in another area at least 3 feet apart. Now, water the rebloomers and not the once blooming irises. Remember, your reblooming irises will NOT REBLOOM without extra water. Have you ever noticed how much better your rebloomers bloom in a wet summer and fall season? I wish I had a dollar for every time I am asked why my rebloomers don't rebloom and they tell me they never give them extra water in the summer. It is absolutely the key to rebloom. Also a little extra fertilizer 2 or three times a year will work miracles for rebloom. It must be a light nitrogen blend like, 6-24-24, 6-12-12, or 5-10-10. Apply in March, late June, and October for most zones. Colder climates may back the fall application up a month for the fall application and pass the summer application. I don't care what how many times I give culture tips to iris customers, there is always an exception to the rule. I share with you what I have learned from 31 years of growing and shipping irises to every state and several foreign countries. You should benefit from these suggestions for iris culture. Thanks for listening until the next time. God bless you and your gardens and our country.